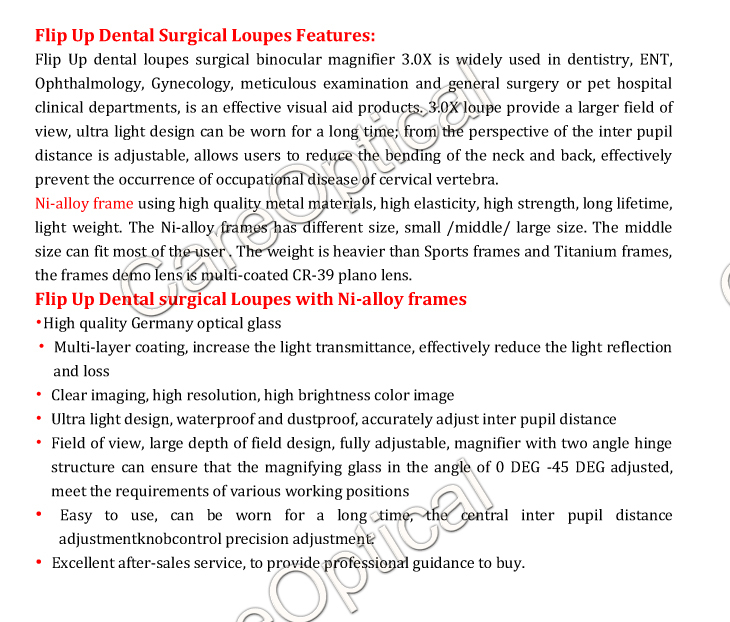 High quality dental loupes surgical loupes 3.5X,Flip Up Style, Ni-alloy (regular metal fames) 3.0x magnification with different working distance,view angle adjustable, pupil distance adjustable. 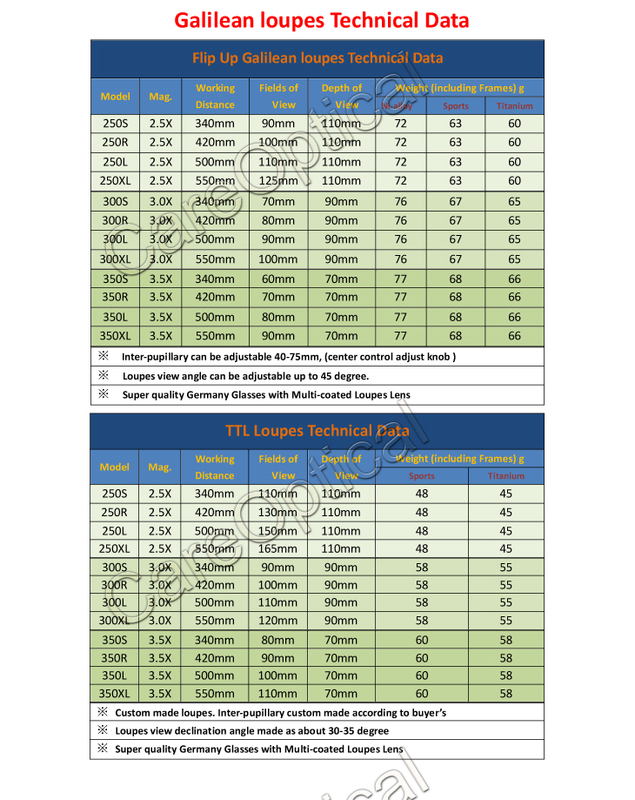 Note: Ni-alloy Frames can be mounted Prescription lens (RX lens ). Careoptical’s dental surgical loupes combine the best in vision and ergonomics technology to help you see, feel and work your best,and sepcially for the dental fields and surgon fields. 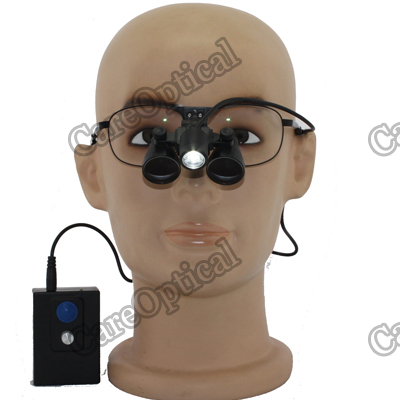 careoptical was the leading loupe manufacturer to integrate ergonomics and magnification, considering the user's neck posture and overall comfort. Superior medical Loupe Lenses & Coatings: Careoptical uses only proprietary high-grade, high-density, multi-coated lenses for our loupes. High-density materials allow our lenses to be thinner and lighter than those made with standard lens material. Our lenses also have multiple coatings to make them scratch-resistant and Anti-reflective, allowing for longer lens life and better vision. 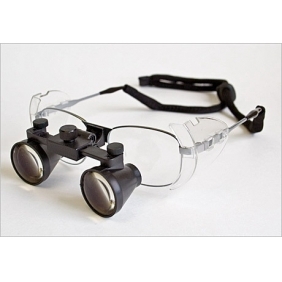 High-Definition Magnification: Unlike other manufacturers, who reserve high-definition magnification for a separate, premium line, all of Careoptical’s loupes are manufactured with high-definition technology. ?•HD Resolution, so you see the crispest and sharpest images. •HD color, so you see clear, not “yellowed,” images. •Patented Laser-Aligned, Bonded Loupes, so you see with the most precise visual alignment. •Greater Depth of Field, so you see the magnified image in focus over a long distance. •Expanded Field Size, so you can see more of your work. 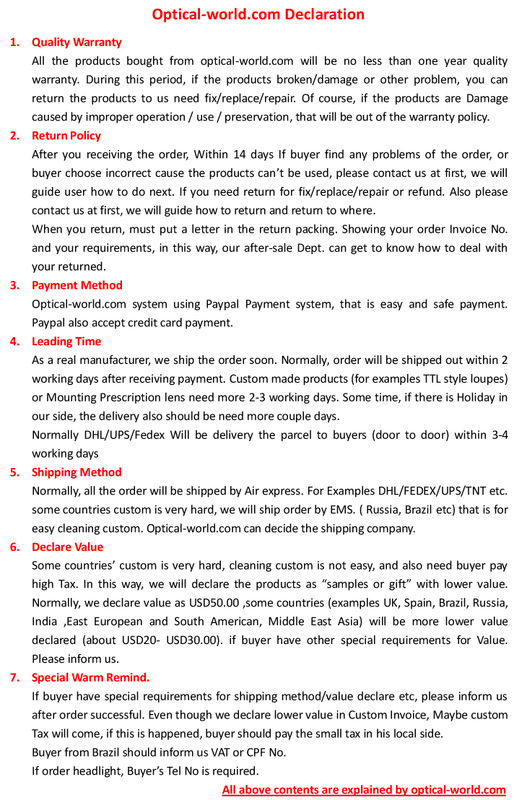 thanks for your purchasing and reviews!hope that you can introduce our website: www.optical-world.com to your friends or colleagues. Tell us what you think about Flip Up Galilean Dental Surgical Loupes 3.0X Ni-alloy Frames, share your opinion with other people. 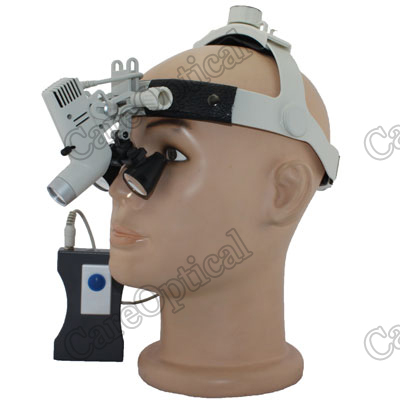 Please make sure that your review focus on Flip Up Galilean Dental Surgical Loupes 3.0X Ni-alloy Frames. All the reviews are moderated and will be reviewed within two business days. Inappropriate reviews will not be posted.